How Denture Implants Can Transform Your Life! Denture Implants Can Give You . .
. . rock solid dentures! Denture implants are implants that support a full denture. A dental implant is like an artificial tooth root. It is usually made of surgical-grade titanium. But if you are going to have some implants because of a loose denture, why not go for a fixed bridge? After all, who wants dentures that you can take out, when you could have fixed teeth? how much jaw bone you have left. To have a fully fixed bridge supported by implants, you normally need at least 6 implants in the upper jaw, and at least 4 in the lower jaw. 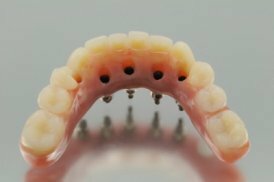 HOWEVER, for implant-supported dentures, you only need 3 or 4 implants in the upper jaw, and as few as 2 in the lower jaw. Fewer implants means LESS COST as far as the implants go. In addition, a denture is far less expensive to make than a fixed porcelain bridge. Denture Implants - "All On Four"
There is also an intermediate option, a "third way". Occasionally we can make what is called a hybrid denture or a beam bridge. These names mean the same thing. In recent years, this technique has also been marketed as "All On Four". This refers to replacing all the missing teeth in one jaw on just FOUR implants. A hybrid denture looks similar to a normal full denture from the outside. It has acrylic teeth and gum-colored acrylic where the gums would be. But looking inside, you would see some big differences. A hybrid denture has no "palate" in the roof of your mouth. Only the line of teeth and some gum-colored acrylic. On closer inspection, you would also see a row of 4 small holes, about a centimeter apart from each other. These are access channels for small retaining screws. You see, this design is supported by 4 implants, and is fixed in place by small screws behind the teeth. So it is like a fixed bridge, but it is made of acrylic. It's like the best of both worlds! You have the small profile and minimal bulk of a fixed bridge, but with the less expensive and more easily maintained denture teeth. Every 6 to 12 months you go along to the dentist, who takes out the little screws, checks and cleans everything, and re-fits the denture. Of course, you should be using an oral irrigator and dental floss to clean under the denture every day, but the dentist cleaning makes sure that any bacteria build-up is removed before it leads to peri-implantitis. Going back to denture implants for removable dentures! They can be very cost effective - you get REALLY SOLID dentures for much less cost than fixed bridgework. They are very easy to repair if something breaks. Fixed bridgework is MUCH more complicated and expensive to repair. They are relatively simple for a dentist to do. The exact position of the implants is not as critical as it is for fixed bridgework. Implant dentures can be made smaller than normal full dentures. Because the implants hold them in place, they don't need to cover as much gum! So, if you have had full dentures for a few years, and are reasonably happy with them except that they are loose; think about getting some denture implants so that you can have really solid dentures!